Go ye into all the world, and preach the Gospel to every creature. He that believeth and is baptized shall be saved, but he that believeth not shall be damned. —Mark 16:15-16. The fortieth day after the resurrection of our Lord was at hand. The eleven apostles were at Jerusalem. They were eating when Jesus came to them. Now that they were able rightly to understand Jesus’ resurrection, He rebuked them for their unbelief and hardness of heart because they had not believed those who had seen Him after He was risen. It is well for us to know the perverseness of our own flesh, and we never know it more fully than when our faith in Jesus is put to the test. Then the question needs to be asked: Will we first trust in and rely on Jesus, or will we first trust in and rely on ourselves? 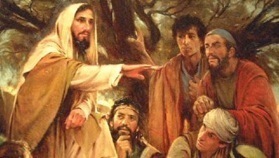 In Mark 16, the Lord Jesus repeated the command concerning the conduct of their apostolic office, which He had previously entrusted to them, by saying: “Go ye into all the world, and preach the Gospel to every creature.” The Lord invested this office with authority when He said: “He that believeth and is baptized shall be saved, but he that believeth not shall he damned” (vv. 15-16). Only in Christ is there salvation. He that believeth on Him and His perfect redeeming work is saved; he that rejects Him and His perfect redeeming work is damned. This Gospel of Christ is for “every creature,” every sinner, every human being in the whole world, for Christ Jesus “is the propitiation for our sins, and not for ours only, but also for the sins of the whole world” (I John 2:2). It is this Gospel which continually announces that “God so loved the world that He gave His only begotten Son, that whosoever believeth in Him should not perish, but have everlasting life. For God sent not His Son into the world to condemn the world, but that the world through Him might be saved. He that believeth on Him is not condemned, but he that believeth not is condemned already because he hath not believed in the name of the only begotten Son of God” (John 3:16-18). O Christian, dear Christian, keep receiving and keep trusting in your Savior, who has died to make the full payment to God for your sins and for the sins of the whole world. God raised His Son from the dead to show that He accepted that full payment from His dear Son, and on account of that full payment, He (the Triune God) has forgiven the sins of the whole “world” (II Corinthians 5:19). Do you show your gratitude for this great, marvelous gift by joining the psalmist again and again in saying: “O give thanks unto the Lord, for He is good, because His mercy endureth forever” (118:1). PRAYER – Almighty and merciful God, by Thy grace I believe that Thy dear Son, Jesus Christ, the crucified and risen One, is the only Savior for me; outside of Him there is no salvation; He is my dear Savior and my only Redeemer. Since I know the fickleness of my wicked flesh, and I see that without Thy grace I could not remain a Christian, therefore, at all times, bestow more and more of Thy rich, saving grace in Christ Jesus upon me, and daily preserve me as Thy dear child through that living, powerful Gospel of my dear Savior, in whose name I pray. Amen.